Not all birds fly south for the winter--at the Connecticut Audubon Society’s Coastal Center in Milford, the windows of the observation room are the perfect portal for exploring the world of winter birds. Join us Sunday, Jan. 20, 1:30 to 2:30 p.m. for a teacher-naturalist led program to learn the field marks that help identify the birds that could be visiting your own backyard during the winter season. 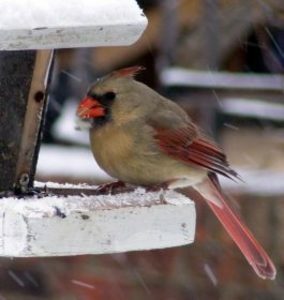 Discover which birds are at our feeders, what they like to eat and their unique behaviors. Get tips on how to create a bird-friendly backyard, and what bird seed and feeders to use. Connecticut Audubon’s Coastal Center is located at 1 Milford Point Rd. The program fee is: CAS members $5/person; non-members $8/person. Pre-registration required. Sign up at: https://www.ctaudubon.org/2018/12/register-backyard-birding-at-coastal-center/; call 203-878-7440 for more information.